We created these fantastic table name cards for Lydia Venus’s wedding and thought they were a great idea. 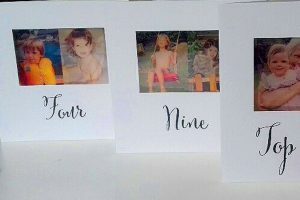 Using photos of the two of them at the same ages as the table numbers. It’s hard finding the photos, but worth doing as it looks fabulous and a great talking point on each table. Do you have any spare tickets to the London Olympia National Wedding Show in Sep 2017? Hi Siobhan Thank you for your interest in getting free tickets to see us at the London NATIONAL WEDDING SHOW 2017. Sadly we are not doing London this Autumn as we find the NEC much better and bigger. If you still wish to see us at Birmingham i am going to e-mail you a link to our codes that should give you access to order online using our allocation of free tickets. Please watch out for the e-mail incase it goes accidentally in your spam. Please if you can share a post please on our facebook page so more of your friends can benefit too. Don’t forget you can order a free sample or free design from Nicola and i on our website https://www.foto-fusion.co.uk.